In this digital-everything world, the power of engaging with consumers beyond sight and sound can easily get forgotten. The impact of engaging with people on such a personal level through all five senses - touch, sight, sound, smell and taste – can achieve incredible results. It’s because of the bespoke and physical attributes of mail that, despite the plethora of marketing options available to brands, it continues to achieve incredible cut-through and deliver staggering results. A new campaign by The Real Media Collective sets out to remind marketers and creatives of this - that mail is a relevant and powerful medium that should not be dismissed. The Open Up To Mail campaign demonstrates the power of mail by providing case studies, downloadable charts, invitations to events, as well as - of course - sending regular direct mail to creative agencies across Australia. The mail pieces will highlight the bespoke sensory attributes of mail – its ability to connect through the five senses: touch, sight, smell, taste and sound. “Over 92% of recipients open direct mail and it remains in the home for some 38 days - that’s incredibly powerful!” says Kellie Northwood, CEO of The Real Media Collective, and she encourages more brands to “open up to mail” when looking to engage consumers. 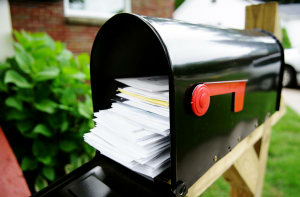 “With more channels to choose from in the modern marketing mix, mail has remained a vital communications channel and its effectiveness has not waivered – in fact, in many cases it has increased as the letterbox is less saturated and now a growing shopping channel as online retail grows Australians are looking to their letterbox for their new shoes, bags and more,” says Northwood. The first mailer focuses on the sense of touch with luxury print embellishments that truly demonstrate the latest in digital and offset print technologies. The ‘touchy-feely’ effect is achieved with spot UV, high-end laminate, 3D gloss and foil embellishments pushing the luxe feel. “Human touch is a powerful form of non-verbal communication and triggers memory neuroscience stimulants. Time and time again, we see that the tactile and memorable pieces of mail make an impression on the consumer in a way that other marketing channels struggle to replicate,” concludes Northwood. The campaign will culminate into a Design Awards calling on creatives and studios to design the ‘Best DM piece’ and the campaign will then produce the mailer for all Open Up to Mail subscribers.